The sun was out and it was crisp and clear – was this going to be the final hot weekend of the year? 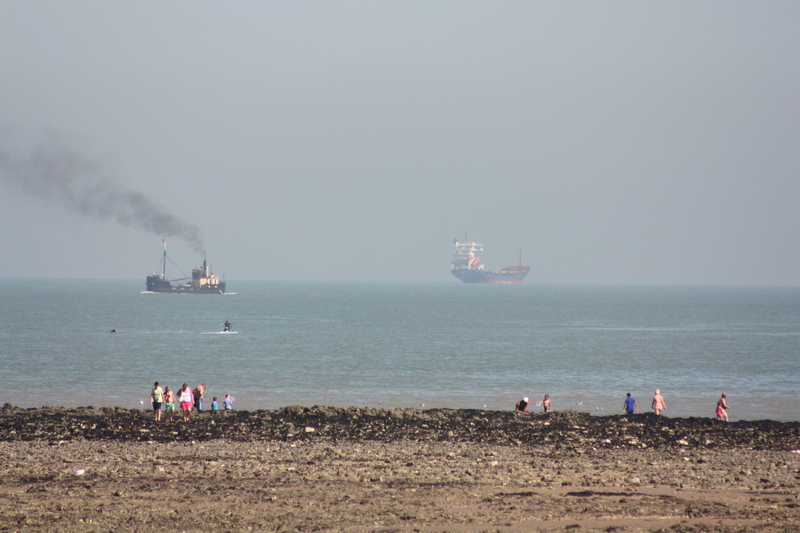 It was quiet at Minnis Bay when we left our car. Although it was not overly early, only a few people were around; mostly a parent or grandparent with a child, hunting around in rockpools and the local tidepool for sealife while the tide was out. One proud grandfather showed off his catch, just about managing to disguise the fact that he was as excited as his grandson with the shrimps, crabs and fish which were enjoying their temporary home in a bucket. The waters lay flat and still, peaceful. The heat had not yet taken hold of the day. There was no noise. It was beautiful. 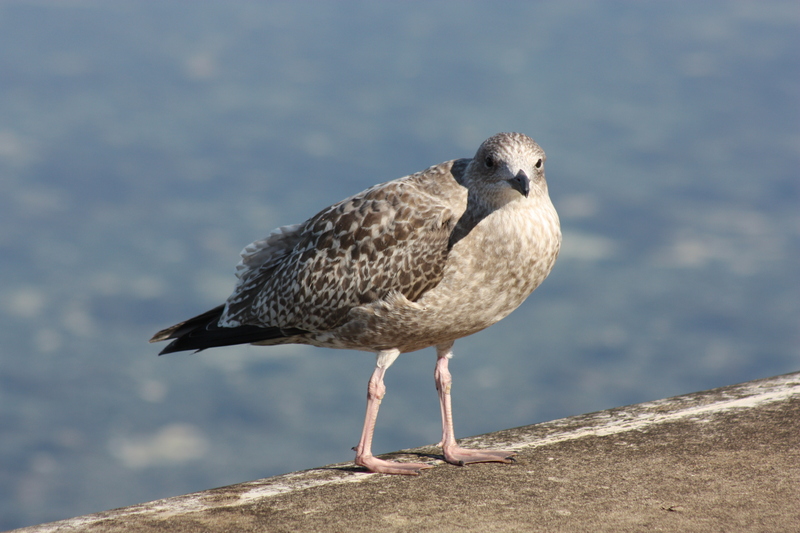 When we left Minnis Bay last week the gulls allowed us to get quite close to them. They were equally as accommodating this morning. We left the tidepool and began our journey east. 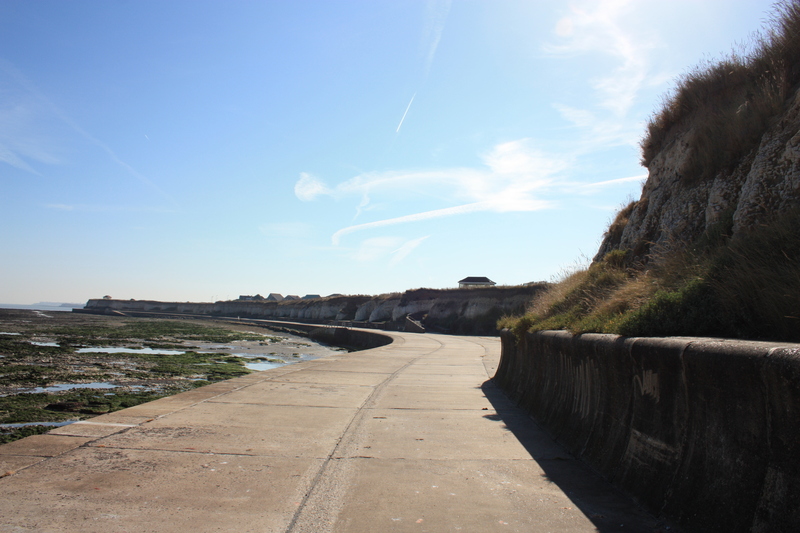 The path was a wide concrete sea wall which also served as a promenade. It protected lots of low chalk cliffs which jutted in and out as they stretched into the distance. Gulls flew low over the seaweed and rockpools. 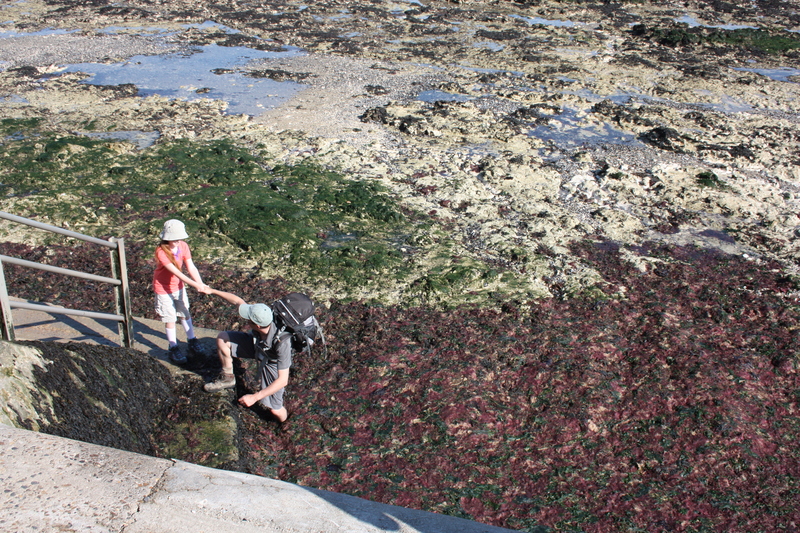 At one point we passed a mass of red and green seaweed lying wet on the beach. In the morning light the rich colours caught my eye, and I decided to get a photo. I went down some steps onto a concrete base, then stepped down onto the beach. It turned out the seaweed was not lying on the beach. It was floating on top of the water. My daughter heroically came down, firstly to laugh at me and then to pull me out. 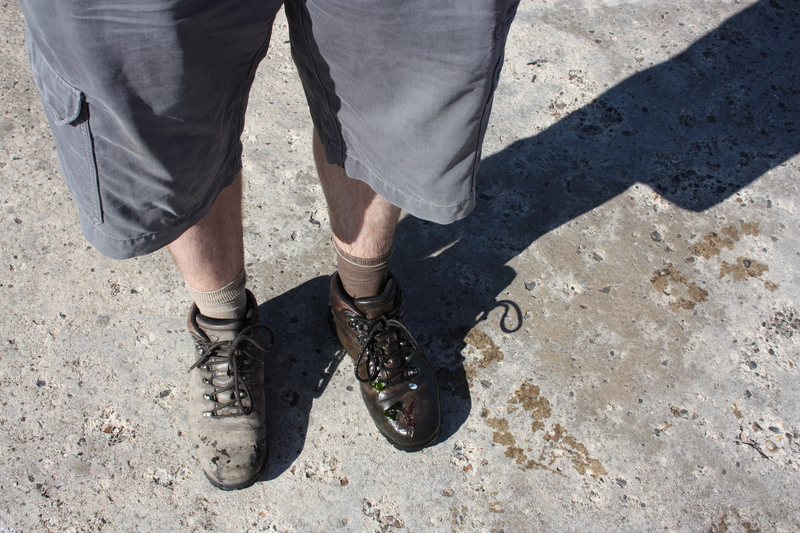 For the next three hours I squelched unevenly as I walked and waited patiently for my wet boot to dry out. 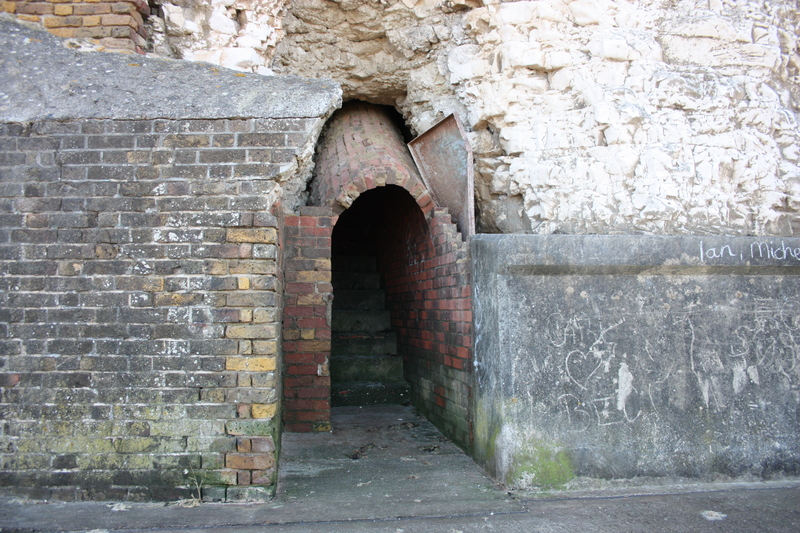 As we continued on towards Epple Bay, we found more and more cuttings, tunnels, stairs and alcoves in the cliffs. Some gave access to the streets or houses above. Others simply served as somewhere to sit and enjoy the view. Just after Epple Bay the promenade stopped and we had to climb some steps and walk around the edge of a cliff. It was a short detour and soon we were back at sea level, in Westgate Bay. The tide had exposed a vast expanse of beach. We were surprised it wasn’t busier. As we stopped off for an ice cream a bi-plane flew overhead. 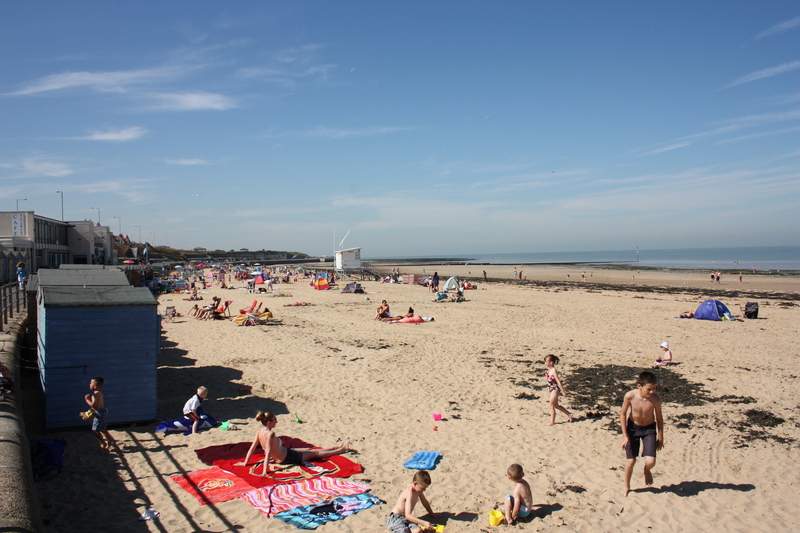 There seemed to be a lot of bays on the way to Margate: Minnis Bay had led to Grenham Bay and then Epple Bay. We were now at Westgate Bay, and to come within the space of a short couple of miles were St Mildred’s Bay, Westbrook Bay and then, simply, The Bay. Each was just that little bit busier than the last. The shipping seemed to get a bit busier too. 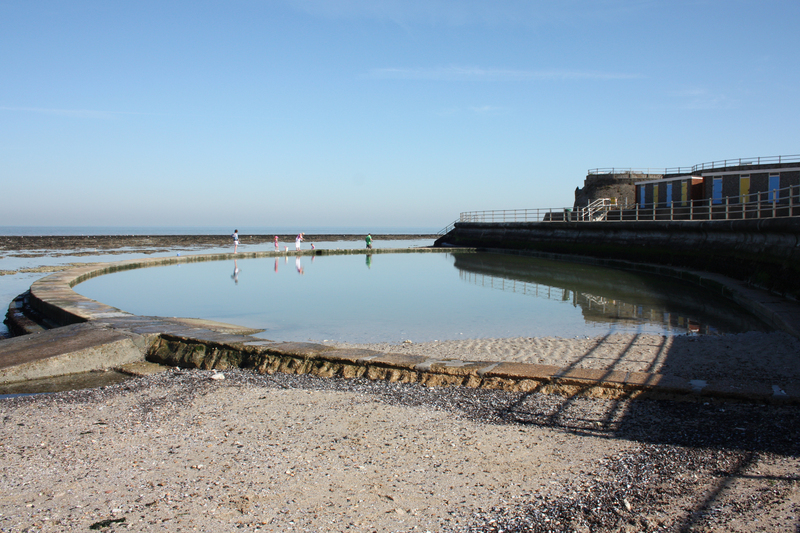 We saw quite a few bathing pools. They got bigger the closer they were to Margate centre. 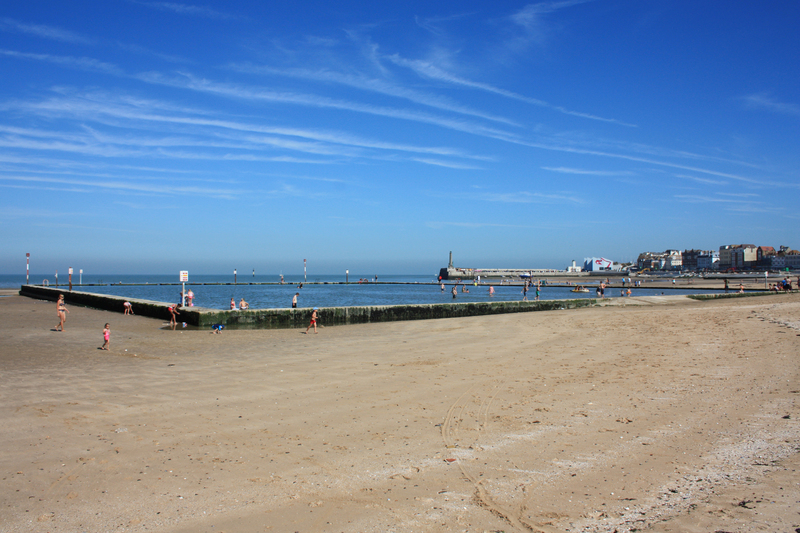 Eventually we reached Margate seafront. There, we encountered what we knew we were always going to have to contend with at some point on our coastal walk: a seafront 30-foot inflatable gorilla. We had reached Margate. Our walk for today was not yet over, but I had a short detour inland planned, to something a little bit special, and that will be the subject of our next post. 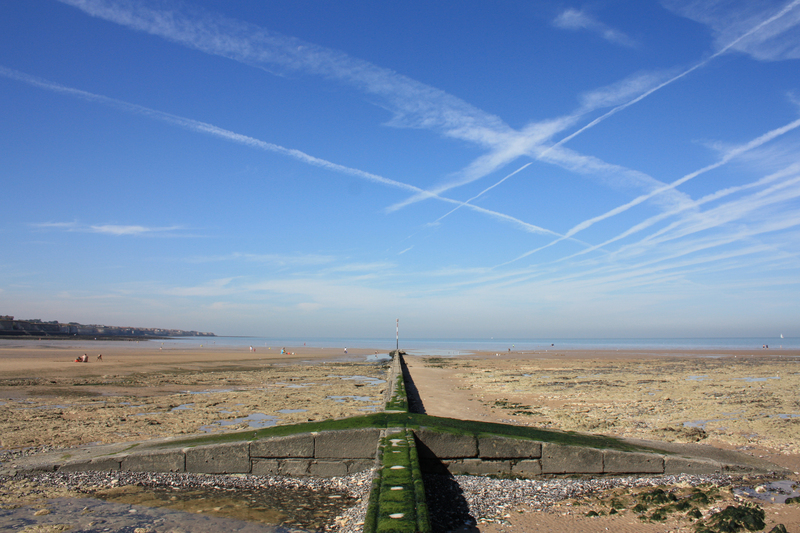 This entry was posted in Kent and tagged coast, Kent, travel, walking, Westgate, Westgate-on-Sea. Bookmark the permalink. 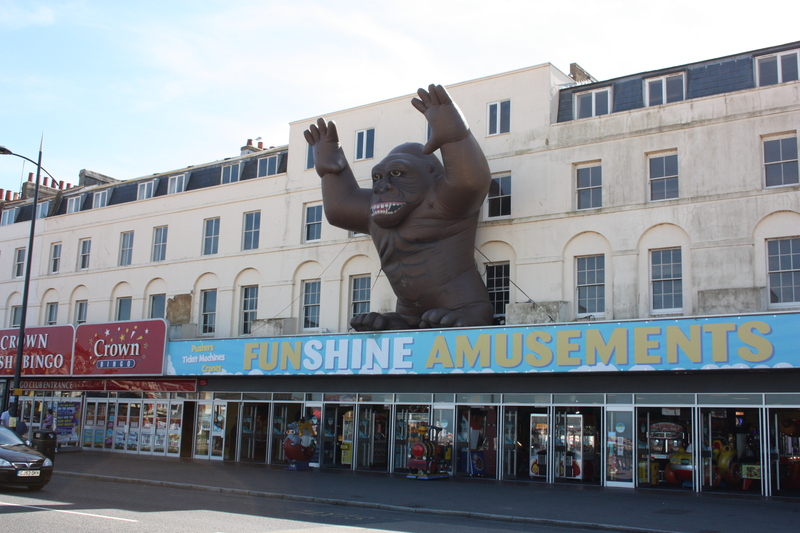 No seafront is complete without a 30-foot inflatable gorilla!